badger wrote: How hard is it going to be to trade a guy who's suspended for 40 games and is pretty much a defense-only player? Probably hard. But if the wild card game counts (I assume it does) he’s missing 28 games next season, not 40. Would be eligible to come back in the beginning of May. Don’t want him because I’m a big fraidy cat who thinks every big contract we sign is going to hamstring us when their shoulder or wrist or knee gives out. This doesn't really factor much into our plans per se, outside of luxury tax implications, but it just occurred to me that KB's arbitration number is going to be pretty interesting based on his performance this year. Has anyone ever gone down in salary from A1 to A2? squally1313 wrote: This doesn't really factor much into our plans per se, outside of luxury tax implications, but it just occurred to me that KB's arbitration number is going to be pretty interesting based on his performance this year. Has anyone ever gone down in salary from A1 to A2? I think it would be pretty rare for that to happen (maybe not even allowed?). I bet they give KB a healthy bump and treat him right like they always have in ARB before. Think that’s a risk you gotta take on a guy like Harper. You only usually go down if you suffer a catastrophic injury that will almost definitely keep you out the entire upcoming year. And even then I don't think you can go below 80% of what you've made previously. Most guys. even after a down year, still get a healthy raise. I'd still expect KB to get ~15 million. i want harper, but what do we honestly make of his 2018? 17 Seconds wrote: i want harper, but what do we honestly make of his 2018? That he's really good. And his "down" year would have still made him the best player on a Cubs team that has a top 3 MVP candidate? His overall WAR was dragged down a bit by the defense rating poorly but I think that’s partially due to him holding back a bit to not hurt himself diving/running in to a wall/etc (especially once the Nats were done) and he also was playing CF a lot where he’s more an emergency guy there than everyday guy there. He isn’t Heyward on defense but he also isn’t that bad. He had the 2nd best BB% in MLB, 15th in wOBA, 16th in wRC+, and 17th in Dongs (2nd highest total in his career) in a “down year.” He’s really good and does things we really need to help cure and permanent chili ball damage/injuries next year. it's a question about how much he's worth and what the cubs should give him. but how was he better than baez this season? Last edited by 17 Seconds on Thu Oct 04, 2018 12:37 am, edited 2 times in total. what happens if harper's BABIP is .350 (like every season other than injury marred 2016) rather than .289? He has a 1.000 OPS. He's 25. He's worth whatever a team can afford. OPS seems like a simple way Harper > Baez this year. TBS Playoffs Insider wrote: what happens if harper's BABIP is .350 (like every season other than injury marred 2016) rather than .289? He has a 1.000 OPS. His LD% was up 1% over career average, GB Rate was the 2nd lowest of his career, FB rate right at his average, infield flyball percentage easily at a career low (over 3% lower than career average and 2% better than any other year), he pulled the ball and went oppo a bit more at expense of up the middle compared to career average, set a career low in soft contact% (over 2.5% down from career average), his med% contact was down but that’s because it was all made up for in a career high in hard contact% (6.5% above his career rate too). He’s horsefeathering good and had a good year. The smartass answer is he’s worth whatever the market says but somewhere around ~$35 aav for 8-12 years seems right. He was better than Javy at everything but BA, SLG and defense. Javy had the better year on a whole. I’m not arguing that. I was just saying Harper did a lot of things better offensively and was assuming that’s more what was meant. Cubswin11 wrote: The smartass answer is he’s worth whatever the market says but somewhere around ~$35 aav for 8-12 years seems right. He was better than Javy at everything but BA, SLG and defense. he flatly said harper would have been the best player on the cubs this season, and then you said harper was better at "everything but BA, SLG, and defense", which is an incredibly pointless statement. i ask again, da fuq are you guys talking about? I was answering your question on “how was he better than Baez” with my response and only assuming that was the intent of the original comment. But Raw will have to answer for what he meant or how he wants to back it up. I don’t necessarily agree with it either. Cubswin11 wrote: Javy had the better year on a whole. I’m not arguing that. I was just saying Harper did a lot of things better offensively and was assuming that’s more what was meant. Speaking of Baez - what are we expecting if he gets 100-120+ starts a SS? 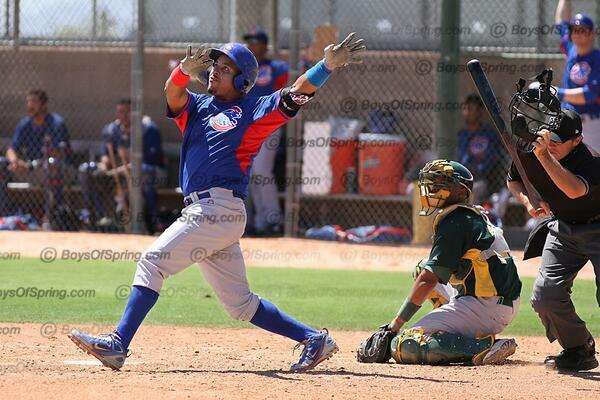 TomtheBombadil wrote: Speaking of Baez - what are we expecting if he gets 100-120+ starts a SS? Defensively? Probably average to above average but not elite like Russell. Offensively I have no idea what to predict other than 30ish HRs. This isn't the first time that Tom has talked about someone playing SS like it has an impact on how they perform offensively, and I don't get it at all. And as for the Harper discussion, I definitely would prefer Machado if he's willing to play 3B.